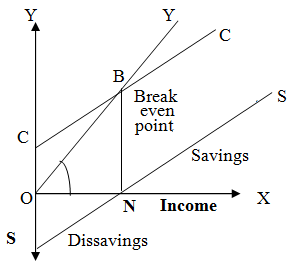 The relationship between income and saving is shown in the diagram. In the above diagram, ‘SS’ curve is the saving curve, which is the counterpoint of consumption curve ‘CC’. At ‘ON’ level of income, consumption equals income at point ‘B’ and the savings is zero. When income is lower than ‘ON’, consumption is greater than income and there is dis-saving because consumption is done through borrowing. So saving curve ‘SS’ is below ‘OX’ –axis. When income is greater than ‘ON’, the consumption is lower than income and there is savings. So, saving curve ‘SS’ is above OX-axis.the propensity to save depends on the level of income. The relationship between savings and income is direct and positive. The relationship between income and saving can be shown in the following schedule. From the above schedule, it is clear that there is direct and positive relationship between income and saving. As the income increases, savings also increase depending upon the consumption expenditure.